Our Amish wood bench is pictured in brown maple with Dark Knight stain and optional 55347-GB hardware. 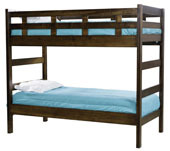 Pictured in brown maple with Dark Knight stain and optional 55347-GB hardware. 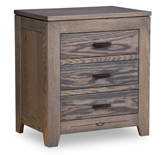 The Adrianna 6 Drawer Chest has a round top edge with molding beneath, and a crown molded base. The drawers consist of four large and two small raised panel drawers. 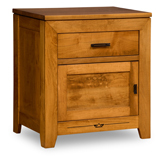 The Adrianna 6 Drawer Chest is handcrafted with dovetailed drawers that come standard with full extension glides and additional options for full extension soft close side mount drawer glides and under mount drawer glides. 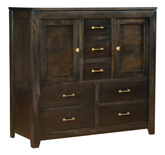 The Adrianna 9 Drawer Dresser has extra utility and organizing in its three small top drawers. This heirloom dresser helps you keep small items like accessories separate. Molded edges frame the top and bottom of this hardwood dresser. The Adrianna 9 Drawer Dresser is handcrafted with dovetailed drawers and come standard with full extension glides and additional options for full extension soft close side mount drawer glides and under mount drawer glides. Pictured with the 40"w x 33 ½"h Adrianna Mirror (not included in price). See drop down box for more mirror options.